CIT welcomes you to our 33rd tennis season! One of our own, Chris Lim, passed away February 28th, 2019, after a short, but courageous battle with cancer. Chris served as CIT Head Pro 2011-2013, and continued serving, when needed, through the Fall of 2018. Planning is underway in 2019 for events in remembrance of Chris. Click here to read my story about Chris. Our 2019 season schedule is now available, starting with Jr. Spring Break tennis camp, April 15-18th! Click here to register for Spring Break Camp. Click here to go to our "Community Programs" page. Click on the community of your choice. Our Spring programs include Ladies Daytime Tennis Clinics. CIT, for the 23nd year, will administer the 2019 CYA Tennis Program. Last year, all three sessions sold out! Take a look at pictures from the Miami Open. It has relocated to Dolphins football stadium! Read Doug's take on the "Serena Incident" at the 2018 US Open here! CIT began it's 32nd year with it's annual Jr. Spring Break Tennis Camp, March 26-29th! "Champ of the Court: Let Me Count The Ways"
at the Mid-Atlantic convention of USPTA Tennis Pros at Army-Navy Country Club. Click here to see all of Doug's "Champ of the Court" drills! Doug's article "My Five Fantastic Tennis Phrases" was recently published in the May 2018 issue of Tennis Industry/Aadvantage Magazine. Click here to read the article. The CIT tennis staff wishes everyone a happy and healthy New Year in 2019!!! Anna received rave review from campers and parents alike while serving as CIT's head professional last Summer. This summer , Anna will continue to direct junior camps, coach the under 12 CYA Travel Team, and assist in the CYA tennis program. She is completing her first year at the University of Virginia. Anna will be returning as Head Pro starting in May. On my bucket list for awhile, I've finally had a chance to visit all of the ATP Masters Series held in the United States. (Miami Open, also held in March, and Great Western and Southern Open, held in Cincinnati in August, are the other two.) I ran into one of the most famous tennis coaches in the world, and an old tennis pro buddy who I was on staff with in Chicago over 30 years ago! Click here to read my other reflections along with pictures from the event. On the left, we had an opportunity to see the roof closed on a rainy Sunday morning. 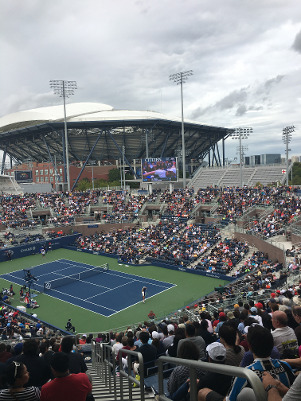 It gave Ashe stadium a much more intimate feel. On the right, is the jewel of the tennis center, in my opinion. It is the new grandstand. By itself, it is a great place to watch a match. 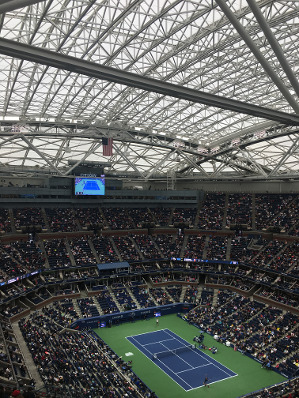 With Ashe, with its new roof as a backdrop, it is quite a setting! Just added a great video clip on how to produce the modern forehand!! Also, read my latest tennis tip article, "My 5 Fantastic Tennis Phrases" in my "Tennis Tips" section of the website. -Our Tennis Buck Prize Page is now online!!! Look at all our prizes by clicking here. "See you back on the courts in 2018!" 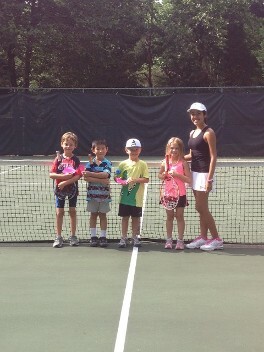 CIT has been providing tennis programs and instruction in Northern Virginia for 31 years. Through the years, CIT has earned a reputation of providing solid instruction based in a fun, game-based atmosphere. 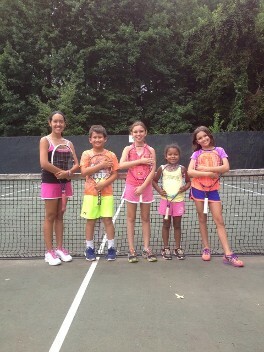 The program is built around each student having a positive and enjoyable tennis experience. 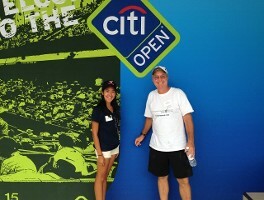 CIT teaching staff Doug Kegerreis and Maria Reyes-Chian attended a USTA 10 and Under Workshop recently at the CITI Open in Washington, DC. They also enjoyed quarterfinal matches of the pro tour event that afternoon. The workshop is part of a national initiative to educate and promote the exciting changes being implemented to get more children learning, enjoying, and excelling at the great game of tennis! High School Tennis: Are you ALL in? 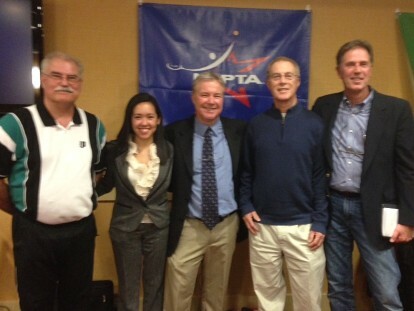 Doug presented at the 2014 USPTA Mid-Atlantic Convention in Fredericksburg, Virginia. As a high school tennis coach for the past ten years at Chantilly High School, Doug is passionate about what a great experience it is for tennis players to play on their high school tennis team, regardless of their skill level. For most players, tennis is an individual sport. Many high-level tournament players are skipping high school tennis. They feel that they can't get the level of competition in practices and matches they need in order to compete at their level. Doug's main response to anyone who questions whether to play high school tennis is this: "The value of the high school tennis team experience trumps everything". The team dinners, secret pals, senior days, the daily support and encouragement of your teammates, lifetime memories, lifetime friendships from that small window of opportunity makes for a great short-term alternative for high level tournament players to the high pressure grind of tournament tennis at the national level. Doug encourages tournament players to manage their time well and schedule their high performance workouts before or after high school practices if they don't feel like they are getting those workouts with their team. But don't ask for special privledges, like skipping team events, in order to workout elsewhere. All players should respect the privledge it is to represent their high school on their tennis team for just four short years. 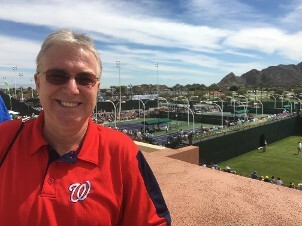 Click here to read Doug's article "My Game Changers: Reflecting on 30 Years as a USPTA Professional"
Watch Doug's complete video on how to play tennis! Just click here. 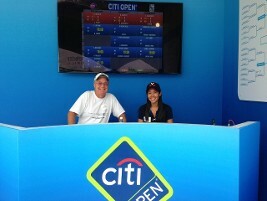 CIT President Doug Kegerreis made his annual trip to the US Open in New York City. 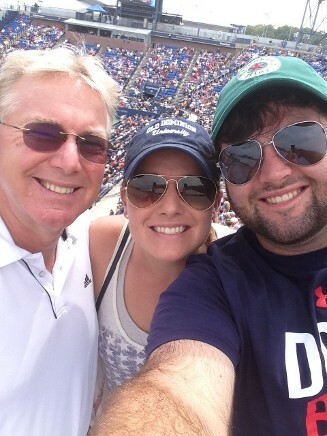 This was Doug's 30th trip to America's Grand Slam, and 28th consecutive visit dating back to 1986. Do you know why TENNIS is the GREATEST sport to play? as the most HEALTHFUL activity in which you can participate? physical, mental, and emotional benefits as TENNIS! Click below to read ALL 34 reasons why tennis is the greatest sport to play!!! See you on the courts in 2019! Email us at Racks@aol.com if you have any questions. Explore a wide range of tennis instruction, leagues, and tournaments for all ages and levels of interest with Chantilly International Tennis. Our friendly, knowledgeable tennis professionals provide an extensive selection of tennis management services throughout D.C., Northern Virginia, and Maryland. From beginning youth and juniors programs to a variety of fun and professional services for adults, put our passion and experience to work for you and experience everything the game of tennis can be. Contact us today for more information on the many ways our wide variety of tennis programs can best meet your areas needs. Get the selection, service, and professionalism you deserve and take your tennis to the next level!